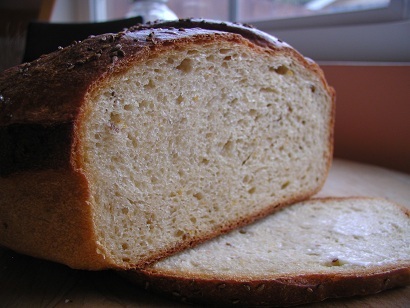 This month, Bread Baking Babe, Astrid, chose Swedish rye from the Tassajara Bread Book. The preparation technique is a bit different than other breads, requiring careful and delicate folding of ingredients. I tried not to be skeptical, and was somewhat concerned whether my right hand was going to survive (it's way over used), so I halved the recipe and made just one loaf. While not a mistake, this is most certainly a two-loaf kind of experience. I fear my solitary loaf will disappear way too soon. I'm looking forward to trying a slice toasted. I chose to sprinkle the top with anise seed, one of my favorite flavors. The little guys actually stuck this time. Must have been the egg wash. I'm sending this over to Astrid for her Buddy Roundup. 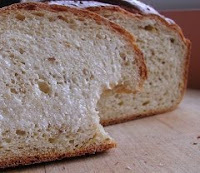 If you don't have the cookbook and would like to try your hand at this delicious bread, stop by Astrid's blog for the recipe. While you're at it, check out the results from the other Babes. That IS the problem with making just one loaf, isn't it. It disappears. 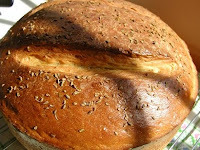 Your bread looks wonderful. Thank you for baking with us! Your loaf does indeed look glorious ... Wishing I had another loaf about now. Can't believe I missed your entry Judy! 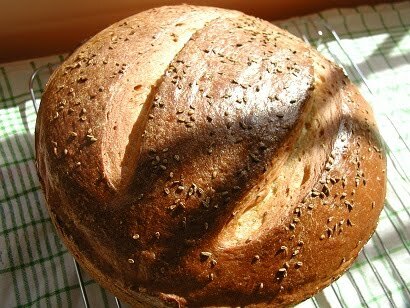 This is one gorgeous loaf, really very nice.